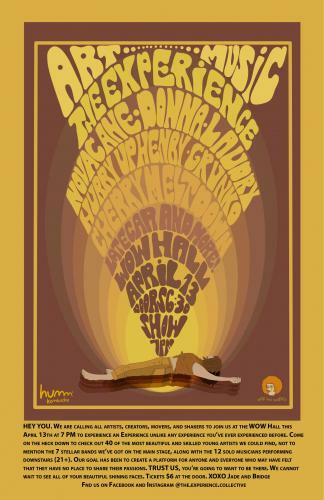 On Saturday, April 13, The Experience Music & Art Fair returns to the WOW Hall featuring entertainment by bands Novacane, Donna, Laundry, Hurry Up Henry, Grunko, Cherry Meltdown and Late Car, plus twelve solo musicians and art by 40 young artists. The Experience is an event that is way more than just a typical college party. It combines an art show with a music festival, with the main goal of providing a platform for never-seen-before artists and musicians to show their work. We are creating a space for artists, creators, innovators, movers, shakers and anyone who has a skill or passion they are willing to share. People in our generation are now basing their self-worth upon how many likes and followers they have on their social media accounts. We ask ourselves this question: How can we create a space where people feel constantly appreciated for whatever they do, regardless of their compliance with social norms and expectations? We believe that every person has something they can contribute, and we have found that incredible things can happen when everyone comes together to create something. Kids in our generation have been conditioned to base our own self-worth on what other people are thinking; individuality and freedom suffers because of this, and people shy away from contributing in fear of being shot down. Instead, we are hoping to introduce a new way of thinking by creating an environment where, no matter who you are or what you love to do, there is a space for you that encourages participation and creativity. We truly believe that everyone has value, and we are here to help you realize that. We began by hosting shows at our house, and our community began expanding rapidly. We quickly realized that we could no longer host this show at our home because the community had simply outgrown it. Last year, we were incredibly lucky to meet our amazing sponsor, who allowed us to seek out local venues to host the next show, and the WOW Hall proved to be a perfect fit. This will be our second year in a row hosting at WOW, and we are beyond thrilled to show everyone what we’ve been scheming up. This is going to be our biggest Experience yet with 40 artists, seven bands, and twelve solo artists. There will be Experience merchandise, original artist prints for sale, free Humm Kombucha, and Yerba Mate. Tickets will be $6 at the door, cash or Venmo. We can’t WAIT to see all of your beautiful shining faces there - and trust us, you’re not gonna wanna miss this one.